Five new books taking you throughout the medieval world. Excerpt: During the eleventh century, men at the court of Song Dynasty China came to imagine in a new way the political entity to which they belonged. They started to articulate with far greater precision its spatial extent – which they now saw bounded by natural topographic features as well as by the historical Great Wall – while simultaneously de-emphasizing an older theory of sovereignty premised on the idea of universal empire…Setting the stage for the new ideas was an East Asian inner-state system that reached a new degree of maturity under the Northern Song (960-1127). During an unprecedented one hundred years of peaceful coexistence with its northeastern neighbor, this dynasty became the first Chinese regime to interact with a steppe-based state according to the principles of diplomatic parity. For the first time in its history, China also embarked on a massive project to systematically demarcate its borders along multiple frontiers. The present study seeks to explore, contextualize, and explain these remarkable developments. Publisher’s Overview: Family, Work, and Household presents the social and occupational life of a late medieval Iberian town in rich, unprecedented detail. The book combines a diachronic study of two regionally prominent families—one knightly and one mercantile—with a detailed cross-sectional urban study of household and occupation. The town in question is the market town and administrative centre of Manresa in Catalonia, whose exceptional archives make such a study possible. For the diachronic studies, Fynn-Paul relied upon the fact that Manresan archives preserve scores of individual family notarial registers, and the cross-sectional study was made possible by the Liber Manifesti of 1408, a cadastral survey which details the property holdings of individual householders to an unusually thorough degree. Excerpt: This essay attempts a close reading of Hrafnkels saga in the manner and style that informed my readings of Auðunar Þattr vestfirzka (Audun’s Story) and Njals saga. It is meant as a small counter-gift to some anonymous Icelanders who lived more than 800 years ago, who gave me my calling. I love this saga. I mean to do ‘her’ right as best I can, and defend her against other lovers, most of whom, I think, did her wrong. Call it revenge. Excerpt: Myths enshroud the study of Mongolian and Inner Asian history. Until the 1980s, popularizers and highly specialized scholars generally wrote the principal works concerning these mostly steppe peoples. Both had significant flaws. Popularizers wrote, in racy prose, about the thirteenth and fourteenth century Mongols, in particular, as barbarians who plundered, maimed, raped, and killed both enemies and innocents during their so-called rampages in Eurasia. 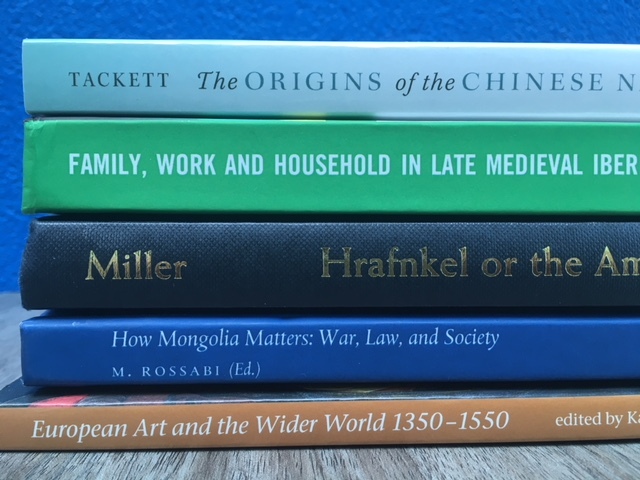 On the other hand, some scholars, explored, in great detail, inscriptions or texts in Mongolian, Persian, Chinese, and other languages, examining specific words with only scant references to the larger contexts of Mongolian history and culture. Excerpt: This book examines select examples of European art and visual culture between c.1350 and 1550, asking how art and objects from this period can be read as the products of global connections. It is concerned with the ties that joined Europe to the wider world at a time when commodities, ideas, designs and technologies circulated over long distances, crossed boundaries and travelled between cultures, with significant consequences for the visual arts. This period in European history is traditionally understood as ‘the Renaissance’, which is often celebrated as a high point in the European tradition, and associated with the new inventions inspired by the revival of an indigenous classical past. Recently, however, the Renaissance has become globalised, as alternative readings of the art of the period take into account the interdependencies that bound Europe with the rest of the world.